Asthma among children and even adults, COPD (chronic obstructive pulmonary disorder), and chronic bronchitis cases have surged over the past couple of decades. Unfortunately, mainstream solutions for respiratory issues are falling short, as usual. But natural solutions like khella and lobelia offer relief, with no side effects. The mainstream medical solutions of inhaled steroids or calcium blockers offer short term relief with long term health hazards. Their usefulness tends to diminish in effectiveness or duration, promoting increased use that causes those other health issues to come on more quickly. Asthma drugs even kill more people than the condition itself. It’s a vicious cycle that can lead to diabetes, high blood pressure, obesity, mental disorders, cardiac arrest and premature death. That’s why both herbal remedies for lung issues, khella and lobelia, should be primary choices for chronic bronchial problems. Khella, commonly called bishop’s weed, is both a vasodilator (dilates blood vessels), and a bronchial dilator. It accomplishes both without caffeine-like or other stimulation affecting the adrenal glands. It also acts to smooth and strengthen heart muscles to enable a stronger heart beat. Khella even promotes gallbladder bile flow and helps eliminate urinary tract stones. In other words, unlike pharmaceuticals designated for asthma that destroy health, khella “side effects” promote good health. Though not recommended for use during an asthma attack, using khella daily as recommended is useful for preventing or minimizing acute attacks. This will at least minimize the use of asthma pharmaceuticals for acute attacks. But khella can be used during a bout of bronchitis to ease up congestion and open bronchial passages and airways. Khella or bishop’s weed is available wherever you can find over-the-counter natural herbal remedies. It can come in extracts or tinctures, tablets, or it can be used as a tea. The extracts and tablets are recommended for daily use as a preventative. Dosage varies slightly, depending on the delivery type, but taking one of those doses just before going to bed is important for asthmatics. It is common for asthmatics to endure asthma attacks that interrupt sleep patterns needed for restoring immune system energy. Khella can be an issue for those with liver problems. So follow instructions from an herbalist or holistic practitioner. Lobelia, also known as Indian tobacco, was actually banned by the FDA a couple of decades ago, but it’s available again from almost any herbal source now. Maybe it was banned because it was effective and natural? The FDA used the alkaloid toxic angle, but the toxic effects happen only if you take an impossible amount of lobelia in a short time period. There were no adverse events reported to the FDA; the FDA’s decision was academic or business related to Big Pharma’s whims. Deeming lobelia one of the world’s most powerful healing herbs, famed Master Herbalist Dr. John Christopher used it often for relieving acute asthma attacks. His Herbal Legacy site notes that there hasn’t been one proven death from lobelia. Even the FDA realized you’d have to consume four pounds in one sitting to invite the grim reaper. Lobelia actually offers almost immediate relief during those periods of excess congestion and breathing difficulties often associated with asthma, COPD and bronchitis. In addition to consuming it in tincture form, it’s chopped up weed can be inhaled from a vaporizer. his cured just email him now on any of this Email address [email protected] or [email protected] or [email protected] thank you DR ,for this i will never stop shearing you testimony. You kill your credibility as an herbalist peppering conspiracy theories through your information. Just the facts, please. If you choose not to open your eyes and see what is going on around you, that is your choice. It is much easier for everyone to put their head in the sand, than believe the truth. There is no profit in healing people, which is why many entities work very hard to remove any herbal or medicine from the market that works. Don’t believe me, do your own research…but take the time to do the research. Multiple cures have been found for horrible diseases and the first thing that happens, is those healing techniques are banned for one ridiculous reason or another. 250,000 people die every year from prescription medications, only 20 or so have died over the numerous years from herbals or vitamins…any usually only when the vitamin/herbal has been tainted or the person has used it in a ridiculous manner. Personally, I would rather have a choice about my health. Every person that raises their hands up and says”conspiracy theorist”, is equally responsible for our multiple rights being taken away with lightening speed. OPEN YOUR EYES….RESEARCH RESEARCH RESEARCH…you won’t like what you find, but at least you will be living in truth, rather than fiction. Living in Thailand with COPD I have recently started using green papaya leafs. I combine the papaya leaf with chopped ginger and green tea. I sometimes add wheatgrass powder, honey and lime juice. The healing effect is amazing. I will certainly try Khella and Lobelia and I believe cannabis oil is very effective too. Lobelia is also amazingly effective for earaches: first put a drop of olive oil in ear than follow with a drop or two of lobelia extract. Another incredibly effective herb for asthma is Yamoa. Thank you Anthony for all your hard work !!!!!! I found that Bragg’s Apple Cider took care of my asthma. Buy you a bottle and read the directions on the side of the bottle. I do my ACV Toddy X 3 daily. 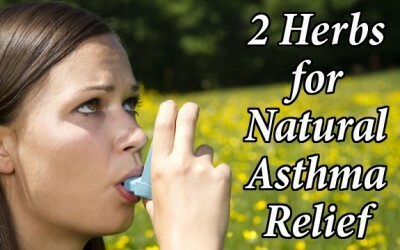 I am asthma and respiratory problem free, as well as allergy free. And no…I have no stock in the company. Just a happy consumer. May not work for you, but this stuff has worked wonders for my husband and me! But for many asthmatics (myself included) vinegar should be avoided. As should smoked foods or anything which has saltpetre as a preservative. Refined sugar also is very bad. I have gone from being very ill, with life threatening attacks, on much medication, to being relatively well with minimal medication and I have not had a life ,threatening attack for decades. How? I changed my diet, cut out processed food, have minimal salt, vinegar, citrus fruit, smoked foods. No white bread. I have gone back to basics and make a herbal tisane in the morning which I sip through the day. One sip of vinegar would close my lungs instantly. Everybody is different. Each individual must find the proper remedy and amount that suits them best. It has taken me a long time but I have found the herbs, spices, juices and vinegar supplements that have gotten me off of RA chems. The ancient Romans, Greeks, and Chinese knew a few things. I would like to try Khella , but not legal in Health shops tro sell in New Zealand..anyone know on here where to pucase or trial Khella? find a patch of ground elder. It’s the same thing. I suspect articles like this use exotic sounding names in order to peddle their goods. After all, who would buy their product if people knew you could just go to any neglected patch of land and pick the real thing for nothing. did you even look to see if there is a side effect or interaction….. Do not take khella if you are taking a medication that can harm the liver. Some medications that can harm the liver include acetaminophen (Tylenol and others)think I will just stick to my meds.there is all kinds of inter actions you suggest people should just drop their meds and use the herbs? Yes, you SHOULD just drop the meds and use herbs. Why would you take a medication you know is harmful to your liver? Over the counter drugs are infinitely more dangerous than herbal remedies. Thousands of people die every year from seemingly harmless OTCs like tylenol and asprin. You’d be hard pressed to find ANY occurrences of death resulting from use of herbs. If you think liver damage is acceptable collateral damage to get a quick fix from a headache, then just go to the doctor and take whatever he recommends. Maybe you’ll get lucky and won’t be one of the hundreds of thousands of people who are dying from the drugs peddled by the medical industry. Cipro is one of the most powerful antibiotics. use it with caution,follow instructions carefully, it can cause neurological damage.I took it for sinus problems-now I have visual migraines. yes dear, you rely on big pharma to cure you. Same as I did. Suffered for year, on a pile of pills a day for my COPD and arthritis pain. Yet because of my herbal knowledge and knowledge of plants, after 30 years of having to take morphine every 4 hours and having several types of inhaler, I now take NOTHING! Not one chemical drug. I am pain free and my lungs are fine. I get the occasional bout of wheeziness but manage it with herbal tea, breathing exercises and herbal oil infused steam. You are crazy if you really believe that there is no harmful side effect from the chemicals you take. Onymee would you mind sharing what you use in you tea and oil? I have started studying herbal medicine and clinical aromatherapy not too far along yet and would like to know what other COPD patients have used that work for them. He is still in the hospital from his last ER visit and they keep giving him new meds that we say no to sue to side effects being things like DEATH! some made him feel worse he slept for 3 days from one had a seizure from another. They are going to send him home on home health care either today or Monday and Im going to be looking for all the info I can and talk to his nurses about me using herbal remedies along side the meds we got them to put him on now. I did buy him a small essential oil diffuser 2 days ago and have him using it at night in his room no one has noticed it I used bay laurel and orange oil he swears it has helped. Onymee asking this again since I never got a reply. Would you mind sharing what you use in your tea and oil? My dad has COPD and has been in the hospital multiple times. his last hospital visit lasted 3 weeks almost, they kept giving him new meds that we would say no to due to side effects being things like DEATH! some made him feel worse he slept for 3 days from one had a seizure from another. He is now home on home health care. Im going to be looking for all the info I can and talk to his nurses about me using herbal remedies along side the meds we got them to put him on now. I did buy him a small essential oil diffuser while in the hospital and had him using it at night in his room no one ever noticed it I used bay laurel and orange oil he swears it helped, since he has been home I have tried other oils, so far he has said they work no matter what he uses but I would like to get him on some herbal teas and better diet he don’t eat much these days but anything I can add to his diet to help would be great. Greetings, omymee! Can you please go into detail on what you used to eliminate your copd? Thanks! Arthritis?–CBD Hemp oil is amazing! What is the dosage for taking these herbs for Asthma?